Trivandrum, February 15, 2012: Aptara digital publishing solutions having its office at Techopark invites applications from highly skilled and motivated candidates for its new Trivandrum team members. 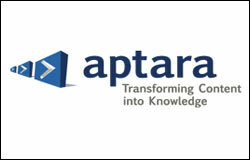 Aptara is a US-based company founded in 1988 around its unique publishing technical expertise. Our over 5,000 professionals are deployed globally to help content providers create, enrich, publish, monetize, and manage their assets in the digital age.